Countryside Landscape & Design has a Forestry division devoted to tree work. 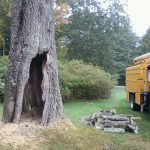 Pruning, dormant pruning, shrub shearing, clearing, tree cabling and bracing, tree removal and stump grinding are services that we offer. Proper pruning will improve the health of your trees and shrubs, and aid in improving structure and long term health. Clean: Selective pruning to remove dead, dying, diseased, crossing, and/or broken branches. This type of pruning is done to reduce the risk of branches falling from the tree and to reduce the movement of decay, insects and diseases from dead or dying branches into the rest of the tree. Cleaning is the preferred pruning method for mature trees because it does not remove live branches unnecessarily. Thin: Selective pruning to reduce density of live branches at the edge of the crown, not the interior, which increases sunlight penetration and air movement. Raise: Selective pruning to provide vertical clearance. Raising the crown shortens or removes lower branches of a tree to provide clearance for buildings, signs, vehicles, pedestrians, and vistas. Reduce: Selective pruning to decrease height and/or spread. Not all tree and shrub species can tolerate reduction pruning, so the species and plant health should be considered prior to pruning. Know when to prune! Spring flowering shrubs should be pruned immediately after blooming. Shrubs that bloom in summer and fall, and shrubs grown primarily for their foliage can be pruned in early spring, before growth starts. Dormant (winter) pruning relies on the same principles of maintenance pruning except that the plant is pruned while dormant to reduce stress to the plant, reduces loss of sap and infection from plant pathogens. This seasonal pruning is often more aggressive, with larger cuts to create more vigorous growth in the spring, leading to a healthier shrub or tree. Deciduous plants produce woody growth and drop their leaves in the fall. With dormant pruning, the oldest branches are removed at ground level or from inside the plant to open it up and reduce size. Many shrubs flowering from new wood respond very well to dormant pruning, producing vigorous blooms. Evergreens are plants that retain their leaves or needles throughout the year. Needle-leaf evergreens do not respond well to pruning in general, while narrow-leaf and broadleaf evergreens are great candidates for dormant pruning (except rhododendrons, which will lose their bloom if dormant pruned). When pruning an evergreen, holes are created in the canopy to allow light to reach the internal branches, preventing the plant from becoming excessively woody, and possible weather damage. Recommended time for Dormant Pruning occurs from late November through mid-March. Shearing shrubs helps to contain their growth, giving a particular form and to maintain overall health. It involves removing the shrubs’ new growth. Shearing gives a formal, tailored shape, and is a good technique to employ for hedges used for privacy purposes. Trees have the ability to grow in such a manner that their physical structure can no longer support their own weight. This is particularly common in mature multi-trunked trees and trees with open canopies. Multi-trunk trees are subject to failure, due to each trunk competing for canopy space, the limbs and foliage grow away from the center of the collective trunks, placing the weight load on one side of each trunk. Failure of any single trunk can create a wound at the base that heals slowly, creating a site for insects and diseases. Structural failure of a tree can result in property damage, personal injury, or the decline of a tree’s health. Cables and bracing rods are tools arborists use to protect or improve the structural integrity of trees. The installation of cables and bracing rods, along with pruning to reduce weight can reduce the risk of structural failure. In most cases, the decision of tree removal is as a last resort, when circumstances show it is necessary. Our arborists can help you decide if a tree should be removed and our professional crews have the skills and equipment to safely and efficiently remove trees. Removal of trees at the President’s House, Williams College. Is causing an obstruction that is impossible to correct through pruning. A very big, hollow, and dangerous tree about to be removed. What can happen when a dangerous tree goes unchecked. Once a tree has been cut to ground level, the remaining stump can be removed by grinding. The stump is first ground into small pieces. After the stump is ground to about 6 inches below ground level, the area is covered by loam and seeded. Stump grinding is a more economical and time saving option and compared to stump pulling, which most likely will require an excavator to pull the stump. This leaves a large diameter hole that will then need to be filled with a fair amount of loam and then seeded. Not all tree work is about the removal of a tree. Our talented arborist, Craig Borden, also has talents as a “cat whisperer”, having rescued a few terrified stranded cats from their lofty ascents. Shrub protection from shedding show and ice. Countryside Landscape & Design can custom build these shelters to suit your needs.